The music in the Slot of Fortune is exquisite. A smoky blend of 20's jazz and blues, accompanied by the noises of a casino full of life, laughter and clinking of glasses; perhaps celebrating a big win. The Slot of Fortune jackpot was standing on almost 20 thousand when I took my spin in Sheriff Gaming's slice of the high life slot. 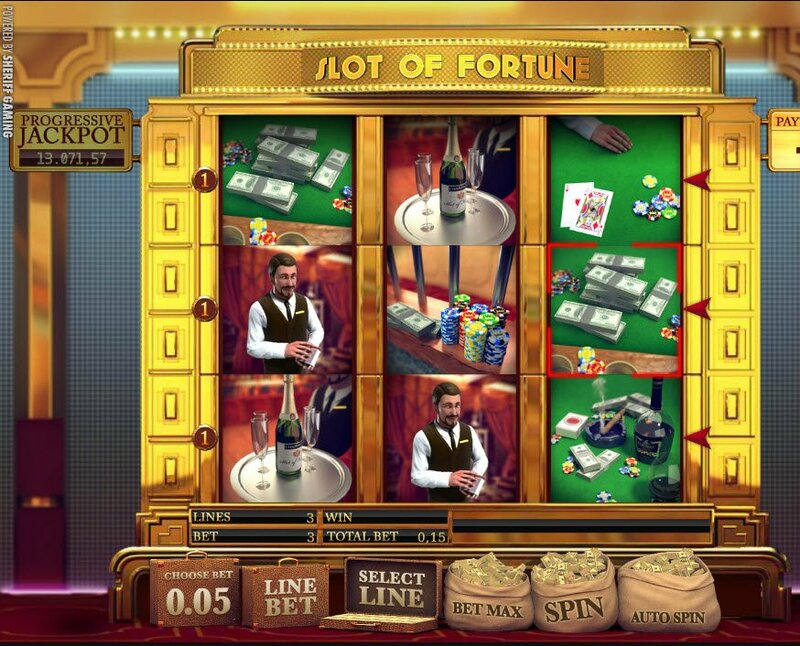 Despite being based on an old school 3-Reel slot machine, Slot of Fortune brings much, much more to the table. There are the ever glorious graphics Sheriff Gaming are famed for, plus that delicious music, that adds swing, panache and soul to the proceedings, that cannot help but reel you into their midst. The icons that lead us down that fortuitous path are real casino classics. From that green felt table, laden with chips and cards, to a hunky croupier, to wads of bills lain out on the same tempting green felt. That, of course, leads to the bottle of bubbly and more casino chips strewn out across the green felt table. 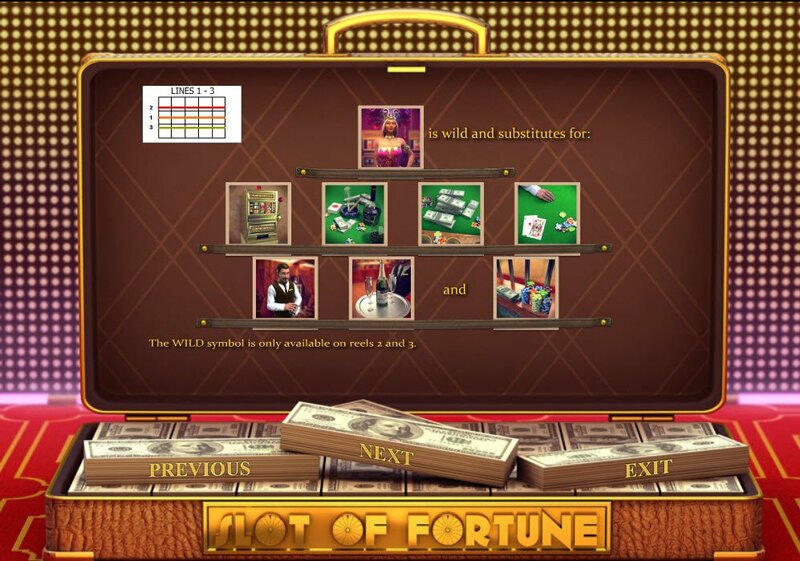 Despite being based on an old school 3-Reel slot machine, Slot of Fortune brings much, much more to the table. There are slots machine symbols too, the casino floor style in a brick and mortar playing palace. There's an immense fortune to be won, the pretty in pink lady who demands your attention, with an enunciated "Hellooo" every so often is our wild symbol, and wild she is too, in that dress! The multi coloured roulette style symbol that has "Spin" emblazoned across it is our wheel of fortune to spin us into a bonus round. It is available on the third wheel only, and helps multiply your winnings. 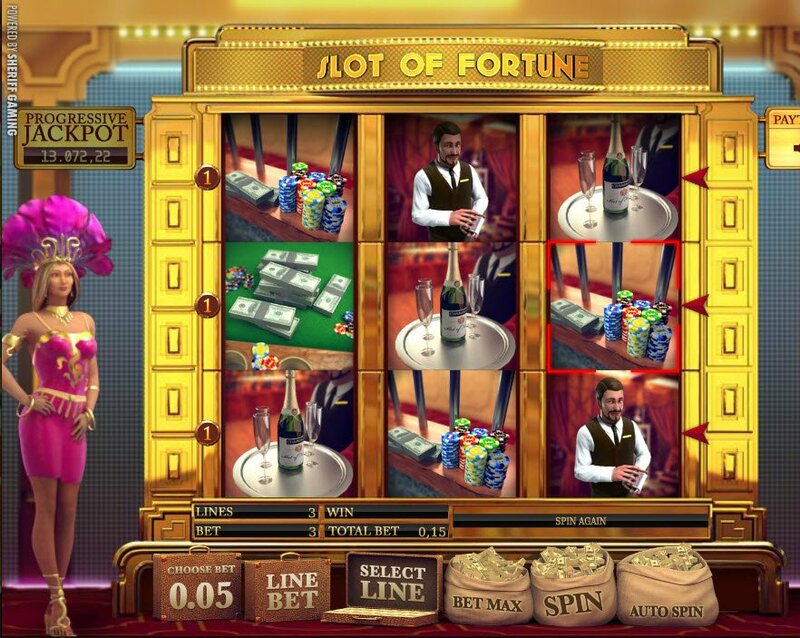 Just be careful you don't spin out of control with this 3-Payline Slot of Fortune bonus round. This astounding Slot of Fortune progressive jackpot can also reach unbelievable depths, but it can only be won when playing a line bet of 5. Will You Find Your Fantasy Fortune Slot Review?